The first-ever natural-wine fair in Germany took place in Kôln recently, as a sign that the movement which is still nascent in this country is slowing taking pace. The naturbelassene Weine like these wines are also called here (which we could translate as wines made naturally) are going out of the dark and have their national event, to which even German producers take part. A handful of importers have been bringing these unconventional wines from abroad (mostly from France) to the German public for a few years and they have now a sizeable following here if yet quite small compared to other similar European markets like Scandinavia for example. This wine fair was named Wein Salon Natürel which looks like a nice blend between German & French, everybody being able I guess to understand the meaning although for the Germans the usual nom-de-rigueur is Naturwein. While this all is certainly the result of a team work (kudos to all the staff who helped all through the weekend including for the dinner), the person behind this whole adventure is still foremost an indefatigable woman who has made a lot to bring the natural wines above the radar in Germany : Surk-ki Schrade . Surk-ki is a wine importer based in Cologne and she also runs a shop named La Vincaillerie, you can stumble on her on prominent wine fairs and tastings in France, I mean the ones featuring real wines made the old way. Even her two sons were there that weekend to help among the staff. Sie alle machen diese natural wines, vins naturels, naturbelassene Weine – oder wie auch immer man diese ungelabelten reinen vergorenen Traubensäfte auch nennen mag. Alle arbeiten "biologisch" oder "biodynamisch" auf dem Weinberg. Alle Weine sind handgelesen, spontanvergoren, ungeschönt, ungeklärt, meist ungeschwefelt und wenn ist die Menge kaum erwähnenswert, die Winzer sprechen dennoch darüber. I'm sure your school Deutsch is already back after reading these few words and you don't need any translation. The setting of this wine event was certainly quite different compared to the one of the mainstream wine event (Prowein) that took place that same weekend in Düsseldorf, the other large town nearby. When I received the email about the whereabouts, I thought it was taking place in a fast food joint, but the Jack in the Box of Köln is actually some sort of Alternativ industrial brownfield with warehouses, trailers and parked cars without license plates. Located at a 15 minutes walk from the Köln Ehrenfed Bahnhof, the warehouse (actually it's not the one one the right but the white one in the background) was bare and spartan but exactly what we needed with the adequate lighting, heating and decoration for this type of no-fuss event. Plus this industrial fallow land had the advantage to offer plenty of parking space for the loaded vans of the vignerons (these areas, unlike their French equivalent, are pretty safe in Germany). The public was very diverse, lots of young people, and also German professionals among whom I spotted Maxime and Jan of the namesake Berlin wine bar. It is noteworthy to underline that Naturweine are still mostly under the radar even for regular wine consumers in Germany and that if it begins to take off here and there it's largely thanks to several passionate indivuduals like Surk-ki Schrade of La Vincaillerie, Alex Zulch of Vins Vivants or Maxime from the namesake wine bar in Berlin to name a few of them. When I walked into the warehouse on saturday the event was quietly starting with bunches of visitors including many youths passing the curtain door with their glass. The entry fee was 10 € plus a 2 € deposit for the glass, which actually we were implicitly encouraged to take home afterwards because it had this nice magic words of Wein Salon Natürel... For this fee you had unlimited access to all these wines, and the pours were often generous which is so cool when the wine goes down easily. Surk-ki was still available for an interview at that point and I jumped at the opportunity to exercise my Deutsch. Surk-ki gently answered my few questions, she said it was not that hard to organize this wine event thanks to the partners that helped along the way, she contacted vignerons through the wine fairs she attended in France (I met her first at the Dix Vins Cochons in Auvergne). I asked also about the only 4 German Natur Winzer that were present at the event (there were a bit more actually) and if she knew how many worked that way in Germany today, she said she did not know exactly but after a few years of personal research she uncovered several of them who were working authenticly. She is optimist about the prospects of Naturwein in Germany, she said that while Berlin enjoyed a good position for natural-wine exposition, it was moving also in München for example with the restaurant Metro Belleville where they served only natural wines. I of course jumped immediately after that in the sea of wine, beginning with the Germans, fearing like it happens in some tasting events that their samples dry up. The first table I stopped at was the one of Weingut Melsheimer from the Mosel region. The wine in the mouth expressesa nice richness and some sapidity, it coats nicely the palate. There's a very light oxidative side in the wine and Thornsten says that this is why the wine was relegated by the wine administration down to this minor (Landwein) labelling. Zero so2 here. Nice wine. Costs 20 € if I'm right. I forgot to take a picture of the label, so here is the one of 2012 which I found shamelessly on the web. __ Melsheimer Orange 2013. Landwein too but the region (Mosel) can be printed here in Germany, It was considered as faulty too and it was just refused a quality appellation (equivalent of our VDQS I guess). Here is a very civilized type of orange wine, petrol notes on the nose. Made from 4 casks with 15 months of élevage. The following Winzer I stopped at was Rudolf Trossen of Weingut Trossen which sits in the village of Kinheim-Kindel where the Celts and Roman grew vines and made wine. Rudolf took over the small-surface vineyards & winery of his father (less than 3 hectares if I'm right) when he was in his early 20s' in 1977 and turned it overnight in biodynamic farming the following year in 1978, at a time the name of the practice wasn't even known in France (In Germany though it had a long history and following as Rudolf Steiner had a deep influence there). __ Trossen Eule Pursus 2014, dry (trocken) Riesling. the color is hyper neutral, almost water. Nice intensity in the mouth with feel of a well-structured wine. Costs 13 €. __ Trossen Eule Pursus 2013. Landwein category. Color : gold shades and turbid. Exciting nose. Nice vivid attack in the mouth, that's beautiful ! A vivid and lively wine, I'd have guessed it was biodynamic. Costs 15 €. tHe people of the appellation system refused the wine the quality label and Rudolf Trossen says that he doesn't need it anyway. __ Trossen Madonna 2014, dry (trocken) Riesling. Nice golden translucent color with a light fuzzy haze. Surprising mouth with a refined tannin touch which coats gently down the throat. A nice thirst wine with the appropriate richness to get along this tannin wrapping. Costs 21 €. __ Trossen Schiefergold Purus 2013, Riesling from ungrafted old vines. Not on the list, a 50-cl bottle he brought for passing amateurs. He made 350 liters of this, probably just a large cask. Nothing added at all here, including noso2. Very clear & limpid. Superb elegance and structure in the mouth. Shines all the way down the throat. Don't miss that if it comes your way. Just next to Rudolf Trossen there was Andreas Durst, a Winzer who prints "Ein Name, kein Programm" on all his labels. He makes thirst wines, or Durst Weine as he happens to bear the right name for his type of winemaking. __ Andreas Durst Sylvaner 2013. Nose super vivid and aromatic with a strong grapefruit character. Light perly side in the mouth, very nice, goes down pretty well. Costs 13 €, a good deal. __ Andreas Durst Orange Wein 2013. The result of a 7-liter experience, he says, bottled 2 days ago. Next year he'll make 200 bottles. In the mouth, notes of berlingot, this old-style candy, grapefruit too. Very aromatic and interesting. __ Andreas Durst Pinot Noir 2012. 260 bottles of this. Nice transparency for this red. Feels a bit alcohol on the mouth with coffee, moka notes. Not my preferred pinot noir. Got some so2. The next table __and I wouldn't miss it ! __ was the one of Enderle & Moll, the only Weingut (here is their website) that I have visited for Wine Terroirs. The winery is located in the Baden region and it has been spotted by many demanding amateurs around the world. Sven and Florian's natural, uninterventionist winemaking with selected parcels stands out compared to the common practices of the mainstream wineries in their home region near the Black Forest. __ Enderle & Moll Burgunder Weiß & Grau 2013, made from pinot gris & pinot blanc in a 2000-liter barrel (really big), 3 days on skins without the stems then pressed with the old vertical press I saw at the facility. No pumping, no filtration. So2 : 24 mg at bottling. Color : relatively dark gold. Nice energy feel in the mouth. __ Enderle & Moll Burgunder Weiß & Grau 2013, this time without added so2. 3 more months in barrel, that's why this one is less turbid. Nice evolution compared with the first one, looks calmer. __ Enderle & Moll Pinot Noir 2013. With some so2. Vivid color and transparency with light turbidity. Nice chew in the mouth, with may be a somehow harsh side, maybe it's just because I know it has some so2.. Some tannins. Made from young vines on flatland and rich soil and high yields, Sven says. Nothing more to selml alas from this pinot noir, soldout. __ Enderle & Moll Pinot Noir Liaison without so2, a different version (if I believe my notes). Same energy and turbidity, lightness in the color. There's a plus for sure on the aromatic range in the mouth, but the difference is surprisingly low, the previous pinot must have had very little so2. Soldout alas, nothing to sell from this one. Aren't there any growers with good parcels near their place who could let them additional pinot noir ? The following stand was the one of Stefan Vetter who makes wine in Franconia, a region above Bavaria. He and his wife Katia were pouring their wines to the visitors. This couple work on a very small surface of vineyards, most of it (70 % if I'm right) being Sylvaner. If you look for great Sylvaner go try their wines. -Nicht mehr, aber auch nicht weniger- Zum Wohl. __ Stefan Vetter Sylvaner 2012. Nose : suave with notes of sweet spices. Not turbid. Who says that Sylvaner is a minor varietal wine ?! Now, that is good... Resonnated through the mouth, plus, there's length and this saline side. Very nice swallowing. Spontan fermentiert, you must begin to learn German, means of course natural fermentation. Costs 8,5 € pro price (without tax). So2 : 24 mg.
__ Stefan Vetter Sylvaner Steinterrassen 2012. Rather ligt in color but unfiltered. Quite mineral, the name of the cuvée hints at some stony terroir (terraces in mid-slope), vines from 20 to 40 years old. Very neat and well, the mouth is fresh and balanced. structured. Classy. Costs 14 € at the winery, pro price is 8,8 €. He made 300 bottles of this. __ Stefan Vetter Sylvaner GK 2012. Made from vines older than 50. The wine is thus more concentrated and full bodied. Some creamy wood notes, nice wine still. 24 € public price. Yields : 20/25 hectoliters/hectare. 200 bottles in total. 11 months élevage in new wood. __ Stefan Vetter Sylvaner CK 2012 ("C", not "G"). Keuper soil, the vines are close to the woods, and the shade prevents the grapes to get too much sun which yields more delicate wines (I understand that otherwise it can be hot in Franconia). The wine has a nice aeria feel when swallowed. Fermentation (which was spontan of course) took 1 year to complete. Dann there was the table of Michael Völker who was there with his wife to pour and explain the wines. Michael Völker works on part of the family vineyard at Voelkler Wein in the Franken (Franconia) region north of Bavaria. His own venture is named 2 Natur Kinder, here is somene to watch in Germany. __ Michael Völker Sylvaner 2013, made from a tiny surface (3000 square meters), bottled in 50cl, 500 bottles in total for this cuvée. His family vineyard surface makes about 5 hectares (his father also buys the equivalent of an additional 15 hectares) and himself is taking care of half of it (2,5 ha) before in the near future (some 4 years) taking over the whole surface, the yields are usually low, about 15 ho/ha. 5mg so2 adde dfor this wine, and probably no free sulfur by now, the acidity was 4,6 and the alcohol is 12 %. Turbid and milky white. So savoury, feels good to swallow, the wines tells you in its own way that you're on a safe territory. Very nice sylvaner. Costs 16 € at the winery. Michael Völker began very recently to make such non-interventionist, natural wines, in 2013. Asked if it was easy to find buyers for these wines, he says it was easy, he sells to Denmark, Norway, Belgium, even if still little in Germany itself [we've had the same phenomenon in France at the beginning of the movement]. __ Michael Völker Sylvaner 2014. Light gold color, turbidity. 10,5 % only ! Man, that's such an easy drinking, I'm already getting beautifully high... Spontan fermentation of course. Acidity here : 6. No SO2 here. 600 bottles in total for this cuvée (75 cl). __ Michael Völker Kleine Wanderlust 2013, Regent [an hybrid] with 60 % noble rot, picked in mid-september. Nice tannins and bitterness, vinified in old barrel. This was an experiment says Michael, with this noble rot the usually-down-looked Regent shows itself in a new light. For unknown reasons I forgot to take the pictures of the bottles, so here what I found on Michael's website. I then stopped at my French non-German table, the one of Paul Gillet who took over recently Les Maisons Brûlées, a biodynamyc domaine which was managed until then by Michel Augé, a man who knows a lot on biodynamics and is a reference in the region. I happened to share the same room on a hotel nearby with Gilles and two other vignerons from Alsace, and this was also part of the adventure. __ Les Maisons Brülées Silène 2013, a white. Lightly turbid. 100 % Sauvignon. There's energy in here, you can't miss it, these biodynamic wines rock... In the mouth : nice vibes, again a lively wine. Costs 13 € public price. __ Les Maisons Brülées R2 L'O XIII, a red Vin de France , this is what was formerly named L'Herdeleau [ "R2 L'O" sounds the same in French]. Made from Gamay, Pinot Noir & Pineau d'Aunis macerated together. Unfiltered, unfined. 15 mg so2 at bottling. Yields of 20-25 hectoliter/hectare. What a pleasure, very nice wine. asked if he got problems with the Suzukii drosophilia which spead havoc in different wine regions in France, Paul Gillet says that he had a few attacks on the pineau d'aunis grapes [these drosophilia dig a small hole in ripe grapes and lay eggs], particularly on the lower slope, otherwise it was fine. __ Les Maisons Brülées Erèbe Vin de France XIII . Côt and Cabernet Franc. Whole-clusteed, macerated together. Darker wine but still rather clear for a blend with Côt. Tastes meat juice, very promising wine. I mean already very enjoyable but I'm sure will be terrific after another2/3 years. I needed a Beaujolais at this point, and Karim Vionnet was my next stop. __ Karim Vionnet Beaujolais Villages 2013. Nice wild nose, the kind of nose that is appetizing. No notes for the mouth but I think I loved it. Costs about 9 € retail. __ Karim Vionnet Chenas 2013. Nice texture, a good Beaujolais for every day, I'd say.Empty glass : superb nose of meat juice. __ Karim Vionnet Moulin à Vent 2012. Very nice nose, generous wine. The top wine at this table. 1 gr so2 at bottling. Price for general public at the winery : 17 € (in the wine shops : 19 €). As usual Andrea Calek (a Czech expat who makes wine in Ardèche) was the most relaxed winemaker on the fair. Here he is pictured with Czech visitors (I don't know if they came specially from the Czech republic or if they live in Germany). __ Andrea Calek Babiole 2013. in de France, 60 % Grenache 40 % Syrah. Super good, man, great vibes in the mouth, superb drink. Meat juice notes, nice acidity, all you can love. He says it costs 9 € retail at this wine fair. Terrific deal. winery but he sells only 5, the other 15 are like experiments for him. I wonder what he does with his experiments, if he needs volunteers to try them, I enlist... But he says he keeps them aside and when the opportunity shows up he blends them with something else. He used to make these experiments with a barrel each but that was too much volume and he downsized some of his trials in demijohns. His whole vineyard surface is now 5,5 hectares and his production 40 000 bottles because he also gets grapes from a parcel at Le Mazel which he used to rent. __ Andrea Calek Chatons de Garde, Vin de France (table wine of course again) 2013. Syrah. One year in casks. Here again, superb freshness but a notch above in terms of vibrations and vividness. Resonnates around the palate. Costs 15 € public price, no need to say it's a great deal. He made 800 bottles of this. Long fermentation (because of the carbonic maceration), which is also why the alcohol is not forward. Andrea Calek says it's not necessarily the age of the vines that counts, he says the vines' age is a commercial argument, what really counts is doing a selection of the best grapes, because actually when you consider what are called today old vines, these are vines that were planted in the 1960s' or 1970s' and the trend then was to plant uninteresting clones, so you often end up today with uninteresting old vines as the years couldn't really correct what was missing from the start. He says humbly that he knows what he's speaking about because he himself has parcels from around 1965. __ Andrea Calek Penultième red Vin de France 2013. 50 % Merlot, 40 % Syrah, 10 % Grenache. Andrea Calek says that he changed the blend composition along the years. What a nose again... In the mouth, a saline feel, really outstanding. The top on this table. Sells for 20 € here. Andrea says that this saline side remains in the different vintages, and oddly, whatever is the blend composition, he doesn't know why. __ Andrea Calek Blanc 2012. 70 % Viognier, 30 % Chardonnay, 2 years in cask. This is the tasting order on his stand. Nose : soft and floral. Color : gold with lemon notes, lightly turbid. Mouth : beatiful mouth touch with this striking acidity. Man, I wouldn't have guessed that tasting [drinking, in the matter] a white after a couple of southern reds could yeald such an enjoyment... He says what we take for acidity is actually minerality, he's sure of that. Then I tasted a few wines made by Branko Čotar, a central figure for natural wine in Slovenia. Branko began to work about 40 years ago from family parcels in the village of Gorjansko in Slovenia in the rocky region of Karst. The small domaine which makes now 7 hectares is farmed on biodynamics and joined Nicolas Joly's Renaissance des appellations in 2007. __ Cotar Vitovska 2011, a white. One week maceration in 2000-liter barrel (old one), 3,5-year élevage. No filtration, no fining. Color : translucent gold, turbid. Nose : very generous, notes of wheat. In the mouth, intensity with a perfect balance. Costs 15 € at the cellar. __ Cotar Malvazija 2009. Another white. We're dealing here with a 4,5-year élevage in barrel, again 2000-liter round cask (not oval foudre). Color : golden like ripe wheat, lightly turbid. Petrol notes on the nose. The mouth is very aromatic with several notes of different things including ananas, lemon. 15 €. __ Cotar Merlot 2006. 3 weeks on skins, 7 years in casks. Branko says that this wine was tricky at the beginning but with time it settled and found its way. Aromas of generous flowers. Vivid acidity too. Who says he doesn't like Merlot should taste this. 25-year old vines. Branko says that under a thin layer of earth there's the stone and the rocks. He exports most of his wine (80 %) to Italy, the U.K., Japan, Russia, Croatia and Hungary. __ Cotar Terra Rossa 2005. A red blend.40 % Terra, 40 % Merlot & 20 % Cabernet Sauvignon. 7 years in barrel, a 1400-liter oval foudre. Now, that's a beautiful wine, no way. Ripe, generous flowers in summer, feminine expression, laidback scents, beautiful length. Certainly the best wine on this table. 4000 bottles total for this cuvée. 17 € at the cellar, certainly a terrific deal. Again, do you imagine the uninteresting wines you can get for 17 € in a French supermarket ?!... This wine is yet very young, Branko says, he now sells the 1995 and he says they're terrific. The next winery was Klinec, also an organic/biodynamic domaine from Slovenia. 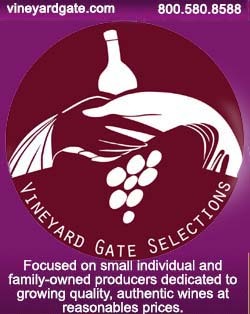 The family-run winery has roots going back to 1918 and has 6 hectares of voneyards split around the village of Medana. The woman pouring the wines was the owner herself. __ Klinec Villa de Mandan Malvazija 2010, a white. Nice gliding touch in the mouth, well balanced. Not too rich, gets down well. 5 days on skins, élevage in acacia barrels, on lees. Just a bit of so2 added. 2 year-élevage minimum. Costs 15 € at the winery. __ Klinec Gardelin 2010, a rosé. Pinot Gris. Colored because of the maceration. Nose & when swallowed : faded roses, nice wine, feminine and delicate. __ Klinec Quela 2007. Merlot, Cabernet Franc, Cabernet Sauvignon. Some astringency with what looks like a bright and vivid acidity (but could be minerality as well). I like this one. 14 % alcohol, feels like 12 %. So2 : 25 mg/l total (no added sulfites). Of course like the rest indigenous yeast, not filtered, unfined. __ Klinec "Medana I Classe" Mora 2009. My notes are not very clear, I think this is the same cuvée than the former but with an élevage in oak, they make it only on good vintages. Beautiful. Again 14 % on the label but doesn't feel like. The label of this cuvée reproduces a document found in Slovenia that proves that the Bordeaux blend was in use here 80 years before the Bordeaux Classification. Sylvain Bock says. He picked the grapes on the 6th of october, that was very late and it was making only 11,5 % potential and the white part helped round a wine that was a bit too sharp, acidic. He says he likes to play with what he has in his chai to see what could come out of light blends. He likes to work with Carignan he says this one comes from the northernmost limit of the varietal in this part of the Rhône, and this geographical oddity brings more refineness and freshness in the varietal wine, he says that by the way his own wine culture of choice is more centered on the wines of the Northern Rhône like the Côte Rôtie and the Saint-Joseph, he looks for this type of refineness and freshness that can be found in the Syrah in this northern part of the region. He wants wines with fruit, acidity,d gourmandise, and not be caught by over-maturity, over-ripeness, he wants to keep this tension. Even at 11,5 % he says that with the Carignan it is always possible to make interesting things even though at this level the structure is smaller. Alas he has to stop working with this Carignan as it was a parcel which he rented from Le Mazel [an iconic domaine of the area] and he has to give it back to the owner. __ Sylvain Bock Reviens Gamay, Gamay of course, vin de France 2014. Le Mazel had helped him at the beginning when he started by leaving him a few parcel to work on, including the Carignan and several parcels of white, but he gives them these pazrcels back. Now he has the opportunity to work with this parcel of Gamay. Reviens Gamay is a reference to famous words uttered in C'est Arrivé près de chez vous (Reviens gamin). This wine is actually a blend of 90 % gamay and 10 % grenache. The wine has what I'd call a marked acidity, on the nice side (for me at least). The next day (the event lasted two full days), I went to the table of Milan Nestarec, as several people had told me the guy was not to miss. Milan Nestarec is a young winemaker operating on his family vineyard in the village of Velké Bílovice, in Moravia. The total vineyard surface today is 10 hectares. No herbicides, all worked by hand. Milan has been making wine for 10 years. (Mickey Mouse in Czech). Sauvignon. The Czechs have a similar appellation system compared to Germany, and so this wine stays out of the "quality" appellation and is sort-of bottled as Landwein (vin de Pays in French). Golden color, turbid, shades of sunn-drenched wheat. Creamy touch in the mouth, very round wine. Vinified in open vat, no racking, and an important detail is that is free-run juice only, he doesn't use the press juice. 10 months in barrels. The wine is dry but feels comfortably round, unusual sauvignon, nice wine. No so2 added at all. Costs 20 € (retail if I'm right). __ Milan Nestarec Antika Podfuck 2013, Pinot Gris. 15 days maceration on skins, not traditional in the Czech Republic, he says. Very fruity and expressive nose. Nice intense tannic mouth, a bit short maybe. Vines 27 years old if I read my notes well. The word podfuck means in Czech something like cheat or unexpected because of this unusual result for a pinot gris. I then tasted a Languedoc, under a strange domaine name, le Bouc à Trois Pattes (the three-legged goat) and also curiously managed by a Belgian expat named Win Wagemans (pictured here on the right). The daring guy farms 5 hectares on the highlands of Languedoc in Mons near the picturesque valley of the Orb river, with varietals like syrah, grenache, carignan, chardonnay, muscat and tempranillo. The guy farms organic of course but he isn't certified. His first harvest was in 2008. __ Le Bouc à Trois Pattes, Tempranillo 2013. The only wine that is bottled at this stage. Generous nose between ripe fruit and faded flowers. Nice chew with well-handled astringency. Whole-clustyered grapes, 3-week maceration with foot/hand stomping to bring down the cap. Vinified in fiberglass vat, no so2 at all. Costs 12,5 €, good deal. __ Le Bouc à Trois Pattes, Syrah 2013. 5 % Muscat. Brut de cuve like we say in French, straight from the vat, not bottled yet. Was more difficult to ferment he says, and he wanted for a long time (5 years) to add a bit of white in his red. Here the astringency is lighter, the substance is lighter also I think. __ Le Bouc à Trois Pattes, Tempranillo 2014, straight from the vat too. Color : light rosé. Nice vividness on the tongue. Generous and feminine, very nice wine. He put the wine in this bottle 4 or 5 days before and he finds that the end of the mouth is foxed (goùt de souris). I like this wine, I must be addicted to defaults... Zeto SO2 here too. Vinified in vat, there will be 1000 bottles of this. 2013 was the first vintage where his reds were made like natural wine [I think he means without added so2]. Another nice discovery was Sébastien Benoit-Poujad from the Languedoc, Sébastien makes wine in Puimisson near Béziers. The family domaine (Domaine de la Banjoulière) is quite big, 50 hectares, and only a small part of the wine is natural, the transition has to be conducted smoothly as the customers have to be at the other end. The soil for this grenache is stony with sand and clay, he says it's not very homogenous, it's derived from moraines glaciaires. This 2014 was bottled 10 days before. Nose : very ripe. 15 hectoliters in stainless-steel tank. Light fiziness on the tongue. Certified organic since this year. Sébastien's father who is 70 has farmed conventionally most of his life and he was reluctant in the beginning when Sébastien began to farm and vinify this way. Right now they still sell most of the grapes to the négoce but all their bottled wine is naturally made. Mouth : nice richness with white flowers aromas. Nice viscosity in the mouth too. Costs 7 € retail only. 12,8 % alcohol, he says. __ Domaine de la Banjoulière, Vin de France Aramon 2014. La Prairie (parcel name). Bottled recently. This varietal was a productive one, planted on the plains of Languedoc after the phyloxera. It was uprooted in the 1960s' and 1970s' because of its bad reputation of high-yields, dark-colored, so2-stuffed wine when Languedow tried to improve its image. Look at this survivor wine : almost rosé, such an exciting color. This comes from an old vineyard (planted 1955), a massal selection. Here is really a thirst wine, Sébastien says that Jean Carmet [a French actor known for his love for wine] called a vin de lever de sieste (a wine for after a nap). Makes 10,5 % alcohol only ! Very fruity with cherry notes. Vinified in cement vats. Costs 6,5 €, nice deal. He made 60 hectoliters of this, or 8000 bottles. Right now he exports to Germany & Denmark. __ Domaine de la Banjoulière, La Pointe Vin de France 2013. Carignan. Named La Pointe because the parcell is spear-shaped. Nose of compoted fruit with already a nice fresh feel. Destemmed, macerated 10 days. Quite balanced in the mouth. 13 % Alc. Feels like less. Costs 10 €. Another easy-drinking wine (really feels like 12 %). Zero SO2 like the rest. His wines don't see any wood. I then walked to the table of Aldo Viola, a colorful Sicilian whom I had seen at the table of Wim Wagemans (laughing at left). Aldo Viola's domaine is located in Alcamo in Sicily, it makes 6 hectares and Aldo took over from his father Don Ancilino. The guy who is the eldest of his brothers & sisters is passionated, I have no trouble imagining him working in his rows and doing all the hard work under Sicily's sun. __ Aldo Viola Krimiso 2014, a white made from Catarratto, a local varietal. destemmed. Maceration of 5 months in stainless-steel vat. Racked & bottled, he added a bit of so2 (10 mg) because there was a worry about some volatile here (all the other wines are made/bottled without added so2). The parcel belongs to a friend but he takes cares of it himself. Altitude 500m, expopsed on north. 1000 bottles for this cuvée. Costs 12 € wholesale (without tax). This varietal is usually associated with bulk wine in the region but he thinks it's possible to make nice wines out of it. __ Aldo Viola Egesta 2014, made from Grillo, another local white varietal. Egesta is another Greek god. Color : golden, like ripe wheat. 700 bottles for this cuvée, costs 15 € wholesale. Whole-clustered grapes put on a pied de cuve to start the carbonic fermentation which lasts from 10 to 12 days, then foot stomping. Bottled 3 weeks before this event. Nice feel of white tannins. Also says it's still a bit green and that it will develop a saline, iode character, something really marked akin to oysters. Now it's nicely structured, refined with oxidative style. Zero SO2. He says that he bottles the wine one bottle at a time, corks them manually and stops 15cm from the bottom so that he hasn't to filter. The wine although unfiltered is indeed very pure and clear. Again, he doesn't press the grapes, just uses the free run, he keeps the non-pressed grapes for a year and it yields another super concentrated free run juice of which he'll make 100 bottles, he names this other cuvée Egesta Sardella and sells it for 23 €. __ Aldo Viola Guarini [named from the parcel] 2013. Syrah. There's the organic logo on the back label, he does't display it for the small-volume cuvées like 1000 bottles because it's a hurdle with lots of paperwork with the administration. 350m alt. Clayish marls. the syrah are clones which they selected at Jaboulet in the Rhône. Destemmed grapes, 18-20 day maceration, élevage in stainless-steel vats, no fining, no filtration, no added so2. 2013 was a fresh vintage (I learn that it can be so in Sicily). Nose : suave. Mouth : nice balance with power and freshness at the same time, notes of spices, menthol. Nice saline feel, refined and well-mannered tannins. Low yields, about 22 ho/ha, plantation at 4200 vines/hectare. There was very little juice, there was mostly pulp, the low yields come from this marl soil. Underneath the marl, there's a shist table. Fermented with temperature control. __ Aldo Viola Guarini Plus 2013. Same lable but no ladybug on it. This is syrah too but with alonger élevage, one year in casks (30 % new French oak). Parcel exposed on north. Goblets on white marl. Steep slope (30 %). Nose : more powerful and inspiring. Mouth : incredible saline feel, outstanding. Costs 12 € wholesale, 3000 bottles in all. Nice coating with a well-handled astringency (and it still young). He says it can be found in France, at Coinstot Vino, also at L'Etiquette and the Cave de l'Insolite. I usually try to stop at tables where I need to learn but I made an exception again when holding my glass at the table of Antonin Azzoni who is slowly taking the reins from his father Gilles Azzoni at Le Raisin et L'Ange. Thee Ardèche wines (Rhône) are a very good deal and when given the opportunity (like for example when Gilles comes to Paris to sell his wines at a wine fair) I never miss an opportunity to restock my cellar with his reds. All the wines there were brut de cuve, straight from the vat. __ Azzoni Nedjma 2014, a white made from 60 % Viognier, 35 % Roussanne & 5 % Sauvignon Blanc. Nice vividness like the one of grape juice, thirst wine. Direct press, fermentation in separate 600-liter plastic vats in order to limit the temperature spikes. This domaine typically doesn't control the temperature during the fermentation. I thought the refrigerated trailer I saw at the winery was actually used for that purpose but it seems not. 12 % alc. __ Azzoni Fable 2014, a red made with Syrah (60 %), Merlot (20 %) and Grenache (20 %). Surrealist freshness here for a southern wine, such an easy-drinking wine... Sells for 8 € public price. Too young, Antonin says, it must be waited 6 months minimum, these are very nice Syrah he says, on the sort were used for the famed Cuvée S that his father used to do. No added so2, never any so2. I swallow that straight. __ Azzoni Bruine. Pet'Nat or natural sparkling made of 90 % cab sauvignon and 10% muscat. Sold out. Public price was 7,5 € and wholesale 4,8 €. Antonin says that he's doing more in the winery, step by step, he adds that his father is an expert on blends, he has the flair to anticipate what blending this with that will yield. The domaine Lucas and André Rieffel (respectively son and father) sits in the village of Mittelbergheim, its vineyard surface is about 10 hectares. Lucas began to make wine himself in 1996, he began making natural-wine pinot-noirs in 2004 and for the white he conducted a first experiment with natural winemaking in 2002. Now that's it, the naturally-made whites enter the commercial stage. He keeps doing a part of his producution filtered and with added so2 though, augmenting the natural part along with the market and the demand in order to smoothly switch the work philosophy. __ Lucas Rieffel Pinot Blanc 2014. Brut de fût or straight from the cask (almost, he filled a few bottles for this tasting). Will be bottled soon. Nice unfiltered, juicy wine, roundness, it's dry, the malolactic is completed. 11,8 % alc. Vinified in big oval alsacian foudres. Costs about 8 € public price. __ Lucas Rieffel Muscat Ottonel (100 %) 2014, Alsace. Nose : refined and expressive. Nice rich feel in the mouth. Very aromatic, like exotic fruits. Unfiltered, unfined, no added SO2. Will stay as is when bottled (soon). __ Lucas Rieffel Pinot Noir Nature 2013. Bottled almost one year ago. Vines on lower slope or also flatland on silt deposits & sandstone soil. But there are several terroirs here as several parcels are used for this wine. Vines age 25 to 40. Whole-clustered grapes maceration, 15 days. Old barrels only. This wine is bottled usually in april or may. Very nice chew, fresh, goes down so well, I love these well-made authentic Alsace pinot noirs... Costs 9 € public price, good deal. Lucas says he exports have his wine, to the U.K. Norway, Japan, Belgium and Germany. Lastly (and sorry to have missed many other Winzer) I went to the table of Jean-Pierre Rietsch, another great vigneron from Alsace, coincidently also from Mittelbergheim, where he farms a roughly-10-hectare surface. Rietsch has more than well-designed labels, his wines are just very enjoyable, here is another Alsatian producer of interest. __ Rietsch Vieille Vigne (old vines) Sylvaner 2012. Super limestone terroir, and this varietal conveys well what the terroir has to say, more than Riesling , he thinks. Dry type of wine, nice sapidity. 15 months in vats, he made trials in wood but it'd go into volatile so he opted for neutral stainless-steel vats. Nice ripe aromas. Jean-Pierre Rietscj began his first wine without added SO2 in 2006 with Pinot Noir, continuing with the whites in 2008. He says he was lucky to have local buyers and customers who were ready to follow his pursuit and thus remained loyal. And in-between the export and other French professional buyers took over. Empty glass on this wine : nice scents of ripe flowers. On his 60 000-bottle production, half or more is made without added SO2 and the rest with modest addings. __ Rietsch Quand le Chat n'est Pas Là, Pinot Gris 2013, Alsace. From what I can decipher painstakingly on my handwritten notes I read that he uses partial macerations because whole-clustered grapes bring stability to wines made without added SO2 (maceration lasted 20 days in fiber-glass vat) . This wine is labelled as Alsace although its color is at odds with the appellation standards [it is almost pink, not really in line with the rules]. Nose nice, almost a pinot noir. 20 hectoliters in total, sold out alas. Gets down easily, there a light perly feel on the tongue. 9 € public price at the domaine. __ Rietsch Gewürztraminer 2013, maceration. 14 % alc. Elevage in 110-liter jars/amphorae. He says it helps attenuate the alcohol feel of the wine. Very aromatic wine, flowery, sweet spices. Golden color (because of the maceration and oxidative élevage). Mouth : very intense with honeyish notes. Costs 18 € tax included (public price). He made a trial in 2013 on a 500-liter amphorae using a vacuum lid, he didn't repeat it in 2014 but he plans to do it in the near future with other amphorae. __ Rietsch Stein 2008, Riesling. His first white made without added SO2. Sold out, you guess it. This is a bottle from his own cellar. Petrol notes on the nose, vividness. There's a saline side here, he says it comes from the type of limestone in this terroir. Well-structured white. 2008 was a super vintage like 2010. The 2014 is still fermenting. Sells for 12 € public price, great deal but alas sold out. He has no more pinot noir to sell right now either, he'll have some early may. Speaking of Pinot Noir I had also the chance to drink later (at the dîner de vignerons) his old vines cuvée L'Age de Pierre (oit was from a magnum - pic on right), a great pinot noir, silky with also this saline character. I think it's sold out too, that's why he brought one of his own remaining magnums. At the end of the regular time window for the tasting, and before the great dinner that would take palce in the same room, there was this great idea to have all the opened bottles brought onto the long counter on the side of the room, so that you could just grab a bottle by curiosity or to indulge in an other pour of something you liked particularly. While if the same thing happened in a conventional wine event you'd had to be picky in your choice (and the prestigious appellation names wouldn't be of much help), here you could just choose a bottle randomly, table wine, appellation or Landwein, it was always a nice experience with no fear of SO2 backlash. That's where I had this great red of Le Mazel (Ardèche). Then we had this beautiful Winzer Abendessen, a dinner with the public (you had to reserve on the Internet on the event's webpage) and with all the artisan winemakers of the day. By itself it was already a good reason to take part to this tasting event. For a mere 50 € you had great food and a stack of open bottles to plunder from, not counting the ones that the winemakers would open on the table. I didn't ask Surk-ki about the details of the intendancy but the service was efficient and it included the regular renewal of the bottles of Germanspring water (Viva con Agua Mineralwasser) , although I must confess that I didn't drink any. I sat at a table with several vignerons whom you can see here toasting : Antonin Azzoni, Paul Gillet, Jean-Pierre Rietsh and Lucas Rieffel, the alsace group we could say as Paul also came from Alsace before settling in Touraine. Antonin, the youngest of the group was very loquacious and we learned a lot. before the plateau de charcuterie came we could sample from various bottles. The food was welcome when the evening came because I must say that I hadn't eaten much along the day, apart from this great liquid food, and considering the fact that I was swallowing the wines now and then, if I was still standing on my feet before dinner this is largely because of the healthy way these wines were made, make no mistake. The event was not only about wine, there was music, and live music of all sorts going on all day, and during the dinner we had this guy who entertained us with his cello. Many natural-wine fairs have this festive side, the food and the music bringing their own touch for a better vinous experience, these are the roots of the wine culture if you look closer, just think to Dionysos or also Rabelais. You can find this wholeness including the music part in many mid-size natural-wine fairs like the one of Les Dix Vins Cochons in auvergne or Festivin in Tokyo.